This Christmas yielded a lot of great loot for my husband and me, and I'm inclined to share my favorite things (other than whiskers on kittens and raindrops on roses, of course) with you. These are the kitchen and bathroom goods that have already brightened our lives this year! 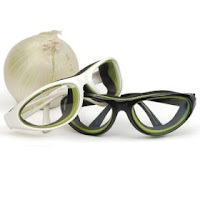 The most popular item I gave this year was these amazing Onion Goggles from RSVP ($18). I think I made my distaste for onion-produced weeping clear in this post, but that was before I discovered this amazing product. They are super-comfortable, really work, and make everyone kind of look like Bono. Sometimes I forget that I'm wearing them, and my husband comes home to find me, be-goggled, reading a magazine or something. At least I haven't accidentally worn them out of the house (yet). This Butter Bell ($20) is such a genius invention! You pack butter into the top of it, and put cool water in the bottom, and you can leave it out on the kitchen counter for up to a month. It keeps the butter fresh and soft. As it does every year, my stocking yielded some lovely soaps and fancy toothbrushes (Santa has always been very hygiene-oriented in my house). Luckily, these are actually two of my favorite gifts to receive. 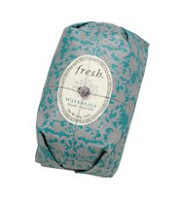 These soaps from Fresh ($14) smell terrific and are packaged beautifully with patterned papers and wired beads, so they don't have to be hidden away in a drawer until you need them. 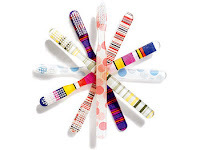 I also love pretty (non-neon-colored) toothbrushes. There is a great selection (including a tortoise shell one with badger hair bristles!) at edentalstuff.com for about $5. They actually look nice next to your sink, and make you feel like your bathroom is ready to be photographed for Better Homes and Gardens (well, once you pick the wet towels up off the floor).